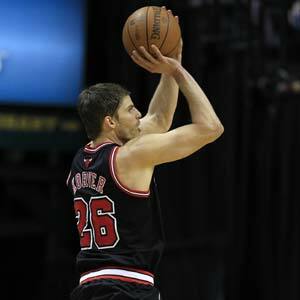 Kyle Korver scored 20 points and Carlos Boozer added 16 for the Bulls, who need just a win over Cleveland on Thursday or a loss by the San Antonio Spurs to clinch the league's top spot, as Chicago beat Indiana Pacers. Lance Stephenson scored 22 points in his first career start for Indiana, which rested Danny Granger and Leandro Barbosa with the No. 3 playoff spot in the Eastern Conference locked up.